Abstract : With snow – clad mountains, tall trees of Chinar , lush green plains , serpentine rivers , and huge calm lakes , Kashmir is set like a jewelled crown on the map of India. It is the valley of Sufis and saints . It is the home of deities and bounties . “ If there is Paradise on earth , it is here , it is here , it is here.” But alas! All this beauty turned ugly as valley bathes in blood of innocents. Following the end of Soviet – Afghan conflict , Kashmir turned virtually overnight from an idyllic retreat into a war zone. The dreaming valley of mountains , water and light was torn apart by bloodshed and politics. Through the experience of his own family and other Kashmiris , Basharat Peer in his debut work Curfewed Night , reveals what life is like for those who live in this tension – filled land. In Curfewed Night, he paints an intimate portrait of a fragile part of the world whose future hangs in the balance. Basharat Peer was a teenager when the separatist movement exploded in Kashmir in 1989. As the following years saw countless young men cross over the Line of Control to train in Pakistani army camps, Peer was sent off to school in Aligarh to keep out of trouble. He finished college and became a journalist in Delhi. But Kashmir – angrier, more violent, more helpless – was never far away. In 2003, the young journalist left his job and returned to his homeland to quest out the stories that had invariably haunted him, he paints a harrowing and intensely moving picture of Kashmir and its people in Curfewed Night. The book beautifully describes Kashmir as known before 1989. A land of peace, simplicity, mutual brotherhood and unmatched beauty. It also deals with the conflict and the rebellion that erupted in 1990 from very humanistic point of view. It is the first English language narrative by a young Kashmiri who describes Kashmiri’s recent tumultuous history as lived experience. It is Peer’s attempt to present the facts of what he has seen, heard and experienced, including but not limited to his own emotional response, and leaves all room possible for the reader to form their own opinion. Anapestic, enlivening and chilling Curfewed Night, is a stunning book and an unforgettable portrait of a war- torn valley. It is a labour of love, a proof of steely determination to make the voice of his people heard. Book Review : “A passionate and important book (Curfewed Night) -- a brave and brilliant report from a conflict the world has chosen to ignore.”	Salman Rushdie The gun of the 1990’s in Kashmir has been replaced by unarmed yet massive peaceful demonstrations and more so by the pen, with an explosion of writers, researchers, columnists committed to writing Kashmiri’s history. Powerful fiction and non-fiction is emerging from the valley with Basharat Peer (Curfewed Night), Mirza Waheed (The Collaborator) and Siddharth Gigoo (Garden of Solitude), writing poignantly heartrending prose, informed as it is by their experiences of the bloodshed here (Kashmir) in the 1990’s particular. The large effect that comes out of it all is that the narrative has been taken up by the people themselves. So every time a Kashmiri writer presenting his or her work on Kashmir, the expectations among Kashmiri’s tend to go up. People start feeling that finally their narrative, of how they saw the things, what they went through, would be told the world, bereft of the lenses of security paradigm through which Kashmir has been viewed - a strategic territory, with not – so – strategic, dispensable people. Curfewed Night, presents a story that is provoking, painful, shocking, atrocious, afflictive etc. There is no need to say much about how effective the book is as it’s already winner of The Vodafone Crossword Non-fiction category. It even seemed to be held in high regard in the author’s homeland of Kashmir, that is no small feat. More over in the words of great Khuswant Singh, it is, “ beautifully written, brutally honest and deeply hurtful.” Peer’s writing is lyrical and heartfelt and his prose is moving. It is a masterpiece of conflict writing and valuable more so because of the absence of voices from Kashmir in literature. 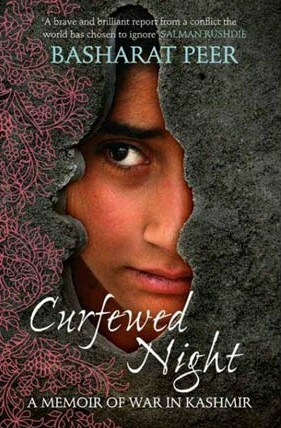 Curfewed Night, contains several stories of betrayal, disappearance, displacement and destruction. It speaks of deep tragedies. It is as much about the author’s life as about Kashmir and its people. The book consists of sixteen chapters running over two- hundred pages. Each chapter carries an appropriate heading, capping the details given inside the chapter. Chapters from one to eight describes author’s early life up to the period when he is all set to leave the valley for plains in quest of new green pastures and to make a successful career. In the second part the author describes his journey as a reporter of a Delhi based newspaper through length and breadth of Kashmir, meeting a cross section of the Kashmiris and noting their reaction toward the insurgency that engulfed his homeland. Curfewed Night, is a chronicle of events profoundly observed by a young journalist who grows up watching this charming valley turned into hot bed of insurgency. As a young student in Delhi, Basharat Peer used to feel a “sense of shame” each time he walked into a bookshop. There were books written by people from almost every conflict zone of the age, but where were the stories of his own land of Kashmir? Some could be found in the work of great poet Agha Shahid Ali, but in terms of prose narrative there was nothing in English but “the unwritten books of the Kashmir experience.” Basharat Peer has magnificently filled this gap in a memoir (Curfewed Night) that instantly marks him out as a new star of Indian non-fiction. Curfewed Night, was not written for Kashmiris. It came into being after peer noticed that the book shops in Delhi contained books about such troubled nations as Palestine, Sudan and Bosnia, and they all felt familiar to him; however stories from his own homeland (Kashmir), were absent on the shelves besides them. Curfewed Night, is Peer’s attempt to represent what he has seen and understood about Kashmir for a foreign audience. In Curfewed Night, Peer shares with his readers portions of his life, his fear of the well-being of his family after a devastating attack on them, the escalating scale of militancy in his home town but also his inability to stay away from Kashmir despite these odds. He talks of a cousin who crosses the border to become a militant (briefly his own boyhood fantasy), and how, his family reminds him of those who fight for freedom without violence – Mohandas Gandhi and Jawaharlal Nehru, but also Vaclav Havel and the Dalai Lama – which shapes his own decision to become a writer proud of his Kashmiri identity. As a reader who has not (yet) visited Kashmir, will find Peer’s description of people and place to be invaluable. He circumspectly depicts the social landscape – Sufi shrines, government offices, village streets, carpeted homes – and then populates it with various actors and victims of the region’s violent conflict. He also gives space to the Kashmiri Pandits who were forced to leave the valley when the fighting began. There are references to the forced mass exodus of Kashmiri Pandits from the land of their birth. The author went to attend his village school one fine morning. He found no Kashmiri Pandit teacher in the school as all of them had fled the valley. Of course he felt very sad and puzzled. “The murders sent a wave of fear through the community and more than a hundred Thousands Pandits left Kashmir after March 1990. The affluent moved to houses Jammu, Delhi and various Indian cities. But a vast majority could find shelter only In the squalor of refugee camps and rented rooms in Jammu and Delhi.” (Page 184) The author also refers to the secular and harmonious atmosphere prevailing in the valley prior to 1989. As he writes, “The practice of Islam in Kashmir borrowed elements from the Hindu and the Buddhist past, the Hindus in turn were influenced by Muslim practices. In my childhood nobody raised an eye brow if Hindu woman went to a Muslim shrine to seek the blessings of a saint. The religious divide was visible on the days India and Pakistan played cricket. Muslims supported the Pakistani cricket and the Pandits were for India. My father’s best friend was and remains a Pandit; my mother had long friendships with Pandit women who taught in the same school.” (Chapter 15, Page 184). Peer ironically describes Valley’s corrupt bureaucracy. According to him, even bureaucrats demand huge bribes for sanctioning monetary relief. This is evident in the following lines, “ The files do not move by itself from one table to another. Out of the relief money of one lakh, the applicant has to spend 25 percent to thirty thousand rupees. Otherwise he will visit Years visiting offices. And once he pays that, we ensure that his name in the compensation Job list goes up and things move fast.” (Page 164) The book ends with hope: peer describes the resumption of bus service between Srinagar and Muzzafarabad which reunites families. Hands seek out to clasp hands, and in those unions, Peer sees the Line of Control fade away. “I watched thousands of men, women and children stand and along the soldier ladden road, welcoming the ones who had stepped across the line.” (Page 221). Curfewed Night, is an emotional tale of man’s love for his homeland, the pain of leaving home and ultimately the joy of return. It describes what a heaven (Kashmir) once it was, and what a hell it now is- all man made! Peer’s Curfewed Night, will always remain to be truthful for the situation of Kashmir at any point of time. A non-fiction can’t be written with more innocence and honesty. It is a narrative of remembrance meant for those who even remotely want to know just what happened in Kashmir better. A book that can be described as an act of ‘lol’- the Kashmiri word for love and yet at once, the word for loss, pain, remembrance and nostalgia. What strikes most of this book is the fact that nowhere does Peer make judgments, nowhere does he unleash hatred, and nowhere does he take sides politically. It is precisely this that makes the book so powerful; the fact that it is written from the heart and the fact that because it talks of events and issues from a personal angle, it seems so much real and striking to us. It is indeed a must read book.